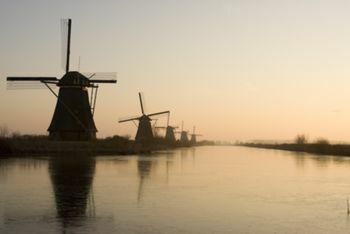 The Western Netherlands, commonly known as the Randstad, is the most urban area of the country with most sights and activities. Host to the Big Four of Amsterdam, The Hague, Rotterdam and Utrecht, it has the most important airports, harbors, museums, restaurants and nightlife. However, typical Dutch rural villages can also be found here, such as Kinderdijk, Marken, Volendam and Zaanse Schans. The Netherlands' newest province, completely formed through land reclamation. The Western Netherlands is the most visited part of the Netherlands and is a very diverse region. It is home to the largest cities of the country, but it also boasts the most typical Dutch rural landscape. Its four provinces are among the most densely populated areas in the world. Much of its territory is part of the Randstad, a conurbation with more than 7.5 million inhabitants that is the economic heart of the Netherlands. It consists of the four largest cities of the country (Amsterdam, Rotterdam, The Hague and Utrecht) and their surrounding areas. Randstad is the Dutch word for "rim city", as it is shaped like a circle with an empty space in the middle. That center is known as the Green Heart, a rural area that mostly consists of pancake flat polders, forests and lakes. The Randstad is an economical powerhouse that much of the other regions in the country rely on. Amsterdam is an important center of the financial world, and many multinationals have based their headquarters in the city's financial center Zuidas (South Axis). Close to that district is Schiphol Airport, which currently is the fifth busiest airport of the continent. Trade is probably the most important economic activity in the Netherlands, and that all is due to its geographic location. The Port of Rotterdam is the largest port of Europe and its trade over the Rhine with the German Ruhr area is an important engine for the Dutch economy. The Hague is the country's political center: the Binnenhof is where the country's most important political decisions are made. It is often known as the "judicial capital of the world": it is home to some of the most important international institutions, such as the International Court of Justice, the International Criminal Court, the International Criminal Tribunal for the former Yugoslavia, the Perminent Court of Arbitration, among dozens of others. Most foreign visitors use the train to get around. The Netherlands Railways  serves nearly every large town, and you can use the website to plan your journey ahead of time. The bus is mostly used as a way of transport within towns or between towns in the same area. Bus travel is time-consuming, confusing and slow, so avoid it if there's rail transport available. There's a plethora of bus companies available that all serve a different set of regions and provinces. You can plan your journey at 9292ov.nl . The Randstad has various motorways. Traffic jams can occur at any time of the day; however rush hour lasts from 06:00 till 10.00 and from 15:00 till 19:00. Major bottlenecks can create traffic jams up to 20 kilometres in length. Most motorways are no wider than 2x2 or 2x3 lanes, despite having some of the highest traffic volumes in Europe. Some hard shoulders are in use as peak hour lanes - traffic is allowed to use the hard shoulder as a third lane during periods of congestion, when signs indicate. Because of the lack of sufficient minor roads, local traffic also uses the motorways for short distances. Cycling is a popular activity among the Dutch and a great way to see more of the landscape. There are bicycle paths between all towns, some of which traverse through picturesque villages, green polders and forests. Some scenic bicycle paths are numbered and sign-posted throughout the region; maps for them are provided at local tourist information offices. Cycling is especially appealing in the Waterland and Zaan Region, Gooi and Vecht Region and the Green Heart. There are dozens of historic towns in the Netherlands that deserve a visit. The most well-known obviously is the historic 17th-century city center of Amsterdam. Its historic architecture can be explored by a boat tour which goes through its lovely canals (known as grachten). The center became a UNESCO World Heritage Site in 2010. Many visitors include a day-trip to one of the West's other historic cities. North Holland is filled with them — Haarlem, Alkmaar, Hoorn and Enkhuizen are less than one hour away as a day-trip from the capital. South Holland also has a few interesting historic towns. Delft is a tourist-favorite with its traditional architecture, canals, bikes, and the world famous blue and white ceramics. Gouda is known from the world famous Gouda cheese — but besides the cheese market, its historic town center is a really fun walk. Leiden, while historical, has much of a student-feel due the presence of the oldest university of the Netherlands there. Utrecht is not visited a lot by foreigners, but it is hard to understand why — it has the amenities of a big city, but its canals feel even more calm and relaxed than those in average medium-sized cities. It is an excellent destination to visit some antique stores or grab a beer while seeing the boats pass by. Amersfoort is a lot smaller, but again, its ancient center makes for a nice day out. The Holland of cheese, windmills, clogs and polders can best be seen in the countryside. Most foreigners at least incorporate a visit to the Waterland and Zaan Region — a traditional region of small villages where a traditional folk culture is still present. The most visited attraction of the area is the Zaanse Schans, which is only 10 km north of Amsterdam. It's a cute display of typical Dutch windmills. Volendam is a well-known traditional fishing village, often visited for its magnificent waterfront boulevard and its people wearing old Dutch costumes. More authentic nearby communities include Monnickendam and Marken, the latter with its characteristic wooden houses. Another famous export product of Holland is cheese, and you might want to catch a traditional cheese market. The largest cheese market of the Netherlands is held in Alkmaar. Gouda is world-famous for its Gouda cheese, and that town also has its own cheese market. The cheese market of Edam is another fair choice if you want to see (and taste) some. Beemster also has its own cheese, which is sold all over the world, but more interesting is the Beemster Polder. Because of its historical relevance, and because the original grid pattern of the area is still largely intact, it was inscribed on the UNESCO World Heritage List in 1999. Beside the Gouda cheese market, South Holland has a lot more typical Hollandic scenery on offer. Every Spring, the Bulb Region becomes alive with miles and miles of enormous flower fields — including tulips. 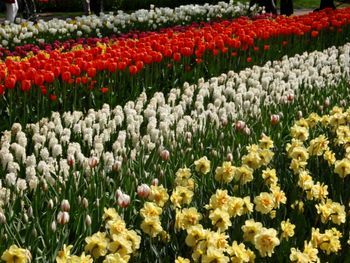 Hundreds of thousands of visitors go to the Keukenhof each year to see its beautifully arranged flowers. The windmills at Kinderdijk, about 20 km east from Rotterdam, are very authentic and make a great stroll through the countryside. Delft is also a must-see for its typical Dutch blue and white ceramics. Flevoland is a new province reclaimed from the sea, but oddly enough, there are some traditional communities residing here. The reason for that is that former islands have been integrated into the landmass that is now known as Flevoland. Urk is one of these former islands, and one of the most religiously Protestant communities of the country. You might still spot some traditional villagers in their old costumes or wooden shoes. Another former island is Schokland, which used to be a similar community like Urk, but it had to be evacuated in 1859 due to destructive floods. A ghost town still remains, and it has the honor of being the first UNESCO World Heritage Site of the Netherlands in 1995. The region is filled with history and there are plenty of castles and fortifications to be found. Surrounding Amsterdam in the province of North Holland is the Defence Line of Amsterdam (Stelling van Amsterdam), a 135 km long ring of fortifications around the capital city. In total, it consists of 42 forts about 10 to 15 kilometers from the city center. It's surrounded by low polder lands, which could easily be flooded in time of war. While the line was constructed from the 19th-century, many of its 42 forts are actually structures from the Middle Ages. One of them is the Muiderslot, a 13th-century castle in Muiden thats definitely worth a visit. Nearby are the 17th-century fortifications of Naarden, which are among the best preserved in Europe. The town is an example of a Spanish star fort, in an exceptional quality and complete with fortified walls and a moat. Weesp is another fortified town near Amsterdam, and could be a nice daytrip. Then there is Castle De Haar in Utrecht, which has a history since at least 1391. It did fell into ruins in the 17th-century and had to be largely rebuilt in 1892 by the Dutch architect P.J.H. Cuypers — he did a magnificent job at it. Rotterdam is the only Dutch city that could be thought of as having a decent modern skyline. It was already a center of modernist architecture in the early 1900s, but since its city center was heavily bombed throughout World War II, it got a completely different feel than traditional Amsterdam. Rotterdam is a play garden of modern architects, which has led to the largest residential building (Montevideo Tower) and the largest office building (Maastoren) of the country. The Euromast and the Erasmus Bridge are must-visits as they are an integral part of the look and feel of Rotterdam's skyline. The city is also home to some quirky architecture, such as the cube houses. Utrecht has the Rietveld Schröder House, arguably the only true De Stijl building and another UNESCO-designated site. Other modern architecture nuts might want to spend some time in Hilversum, where architect W.M. Dudok designed a lot of buildings (and even whole neighborhoods) in the New Objectivity style. His most important creation there is the Hilversum Town Hall. Many other architects have also contributed to Hilversum as it is today, including Jan Duiker, MVRDV, Pierre Cuypers and Ben van Berkel. Flevoland is a new province, its land has been reclaimed from the sea after World War II. This gave the province a completely different feel than the other traditional provinces. Almere is a suburb of Amsterdam, and while many Dutch claim it as the most boring city of the country, it does have a lot of modern architectural highlights. Some neighborhoods in Almere gave their inhabitants the freedom to design their own building. Others have been designed by famous architects, such as La Defense Offices by Ben van Berkel. Cycling is a popular activity among the Dutch as it is a fun way to get some exercise and get around beautiful towns and the surrounding nature. Obviously a bicycle tour through the center of Amsterdam is well-worth it, but many other regions are fun to cycle through as well — such as the Waterland and Zaan Region, the Gooi and Vecht Region or the Green Heart. During Springtime a cycle tour through the Bulb Region is well worth it as you can take pictures of enormous and colorful flower fields. When you say beach, most Dutch people will think of Scheveningen, which is an integral part of the city of The Hague (don't say this out loud though as the people of Scheveningen feel their town as having a separate identity). It is the most popular seaside resort of the country, and expect it to be very crowded when the temperatures get tropical. It has a long sandy beach, an esplanade, a pier, and a lighthouse. The 19th-century luxury hotel and restaurant Kurhaus makes for an impressive sight and is well-known all over the country. The most important seaside resort of North Holland is Zandvoort, but it is a lot calmer and is not to be compared with the former. Other calm beaches can be found in Bergen, Kennemerland, the Bulb Region and the island of Texel. Many locals enjoy water sports at the artificial lakes in the area. Wijdemeren, Aalsmeer, Kaag, Stichtse Vecht and plenty of destinations in the Green Heart can be visited for this purpose. The Western Netherlands have a cuisine that is remarkably different than the other regions in the country (Western cuisine includes Zeeland and Southwest Gelderland). 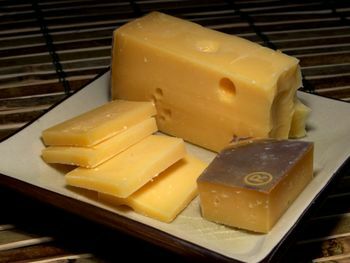 It is known for its world famous cheese, such as Gouda, Leyden, Edam, Leerdam and Beemster cheese. Some of these cheeses, mostly notably Gouda, is sold in supermarkets all over the world including the United States and the United Kingdom. Another dairy product home to the region is butter. The butter produced in South Holland is known for its large amount of milkfat compared to butter from other European countries. Buttermilk, that is produced during the butter-making process is also a typical product for the region. As the Dutch have always fought against the sea, seafood is some of the most traditional food of the region. Raw herring is a must-try, especially with cut onions sprinkled on top of it and wrapped in a bread roll. Other seafood you could try are kibbeling, mussels, eels, oysters and shrimps. You can buy them in sea food carts in the city center of most towns or in supermarkets. Beer is the traditional alcoholic beverage of the region, especially the pilsner variety (known in Dutch as pils). Every town has a bar with its local beer on offer, in larger cities bars usually have a wider selection of beers available. Jenever is a high proof juniper-flavoured spirit that is very popular in the region, especially among older generations. In the English-speaking world, this beverage is known as Dutch gin, and it is the variety from which other kinds of gin evolved. Another alcoholic beverage from the region is advocaat, a rich and creamy liqeur made from eggs, sugar and brandy. It has a yellowish appearance and a smooth, custard-like flavour. It generally has an alcohol percentage between 14% and 20%. The Western region is safe in general. There are some outer suburbs that are better avoided, especially in Amsterdam, Rotterdam, Utrecht and The Hague, but these are mostly outside of the typical tourist spots. The Hoge Veluwe National Park is a popular visit among the locals. Day-trips to 's-Hertogenbosch, Breda, Nijmegen and Zwolle are just a few of the options available. This page was last edited on 27 December 2015, at 13:36.